Hard to believe it’s already July. The month sneaked up on us so quickly, Chareva and I both forgot our anniversary on July 1st, at least until my mom called to wish us a good one. We can both plead extra busy-ness as an excuse. I worked a lot of overtime in June. Chareva spent two weeks in Chicago (along with Sara), helping to care for her parents, who both had medical issues. That left me to look after the dogs, the cat, the chickens, the egg stand and the garden in addition to working overtime. Fortunately, I had a helper for the chickens and the egg business. Back in April, we installed arches in one of the chicken moats (using cattle panels, of course) so we can walk around in there without ducking. 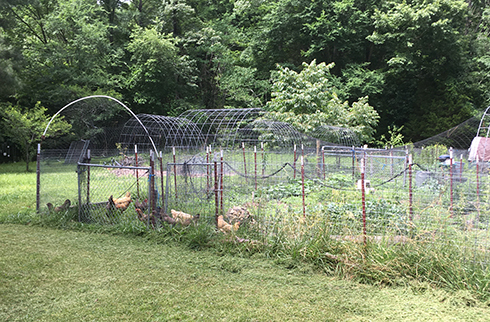 The arches are now covered with netting, and the chickens love running around in the moat and finding fresh bugs to eat. Unfortunately, we have four fewer chickens now. Some critter found its way into the chicken yards and killed three of them within a week. I set up and baited my raccoon trap, only to learn that whatever was killing our chickens wasn’t particularly interested in sardines. The bait sat there untouched for a few days, then disappeared one night … with the trap door still open. Two days later, Chareva found our last remaining rooster torn up near the fence. My guess is that he was doing his rooster duty and trying to take on the predator to protect the flock. Chivalry isn’t dead, but the chivalrous rooster is. So I moved the trap, tested it, and baited it with a can of chicken-liver pate cat food. Two days later, the pate was all gone, the trap door was closed, but nothing was inside except some critter poop. I was half-expecting to find a note reading Thanks for the chicken-liver pate. For future reference, I prefer the turkey giblets. After experiences like that, I have visions of sitting out by the chicken yard in a camouflage tent at midnight, my hands gripping a rifle with a night-vision scope. Come on, critter, I dare ya. It’s you or me. Then rationality kicks in and I decide I should probably get a good night’s sleep and go to work the next day. So for now, the chicken-killing critter is still at large. Chareva reinforced a couple spots where she thought a critter might have burrowed under the fence. So far, that’s worked. No more dead chickens. Her garden has wilted somewhat under the 90-degree heat of the past few weeks, but we’re still harvesting some good stuff. We’ve had several good bunches of kale, and Chareva has turned me into a fan of roasted okra – which I didn’t think was possible. I’ve always suspected okra was created by a mad scientist who didn’t think were enough slimy creatures in the world and thus decided to create slimy vegetables. 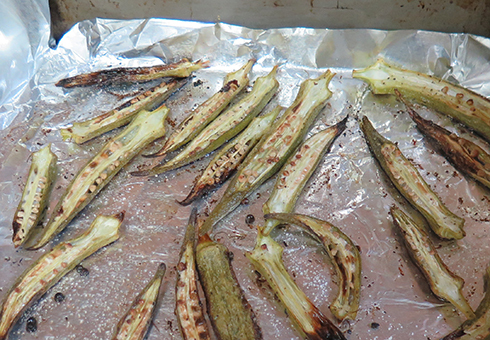 Roasting the okra removes the slime factor, and what’s left is actually pretty tasty. 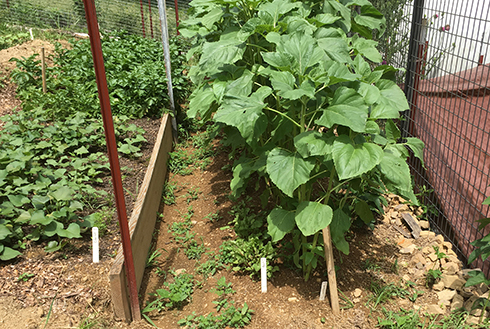 Chareva had some zucchinis growing, but they became infested by squash beetles, so she had to yank them up and feed them to the chickens. This made the girls happy, because during a typical summer, we end up eating fried zucchini, roasted zucchini, zucchini bread, zucchini stew, eggs with zucchini, zucchini surprise, etc. My dad once warned me that if I left my car unlocked in the summer, people would leave zucchini in the back seat. 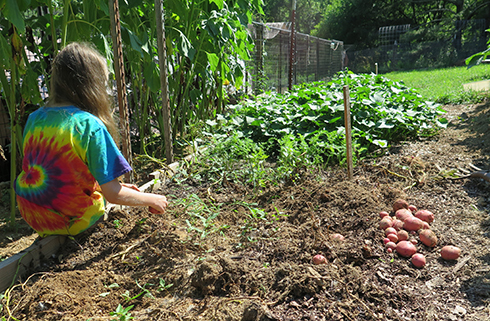 Chareva and Alana harvested some potatoes last week. Just like with greens and tomatoes, the difference in flavor between what we buy at a grocery store and what we pull from the garden is amazing. All these potatoes need to be delicious after cooking is a little salt … not that I’m averse to adding butter and sour cream now and then. Fresh food is one benefit of living on a small farm. Another benefit is being legally allowed to shoot off fireworks on our own property. Last year we set off a bunch of little bottle rockets and two bigger rockets. This year we decided to put on a more impressive show for ourselves and stocked up on some big boom-boom makers. Unfortunately, it’s raining as I write. I guess we’ll save the show for next weekend. To our American readers, Happy Fourth of July. To everyone else, Happy Monday. Frying okra will also remove the slime. If you want it in stew, you need to add a tablespoon of vinegar to cut the slime. Happy Fourth! I loved okra in basic training, but when I tried it later, I realized it was being incredibly hungry that made it taste good. There doesn’t seem to be any restriction on fireworks in Indianapolis. It sounds like a war movie and smells like a shooting range here. I got to see a lot of great fireworks just by standing in front of my house, but my eyes are irritated from all the smoke. We have a neighbor somewhere down the road whose show rivals what towns put on. I’m guessing his nearest neighbors don’t bother trying to sleep until it’s over. 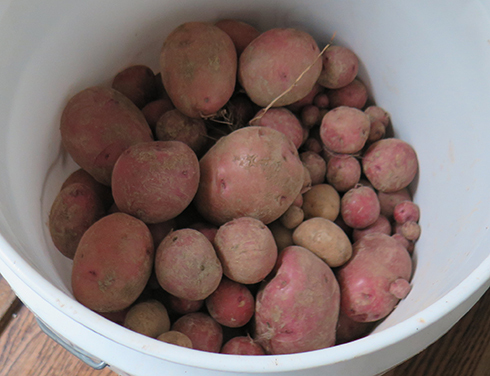 You could always eat those potatoes, then have some late night indoor “fireworks” later. From the Bay State where it all started… a big Happy Fourth of July to you and yours! BTW… I forget to mention… a belated Happy Anniversary to you and Chareva! Congrats! You didn’t say how long you guys have been married. Sixteen years. We were married on July 1, 2000. There’s not many today that can say that! I have had fried okra and that is tasty, I did have a beef vegetable soup that also contained okra. From what the cook told me, the okra “slime” helps to thicken the soup to almost a stew texture. It was very good. Slime thickener. Give it time, someone will sell that in can. It’ll never sell marketed that way. Yuck. I hated boiled okra until I was an adult. Mother put whole okra in her beef vegetable soup, so I could eat around it. I didn’t mind the flavor, just couldn’t handle eating it. I did love fried okra, but roasted would give you the same without the carbs from the breading. I like okra in a vegetable stew made with eggplants, peppers, carrots, onions, tomatoes. Eggplants and peppers are also slimy when cooked, so okra doesn’t stand out . Thanks for the “Christmas Story” reference. RIP, Chivalrous Rooster. Hang in there, Farmer Naughton. Sometimes ya gotta have a little sympathy for Elmer Fudd, though you are dealing with something a bit worse than a wascally wabbit. Could we have the instructions for roasting okra? I don’t mind the slime, but it would be interesting to taste some okra without it. Thanks much. Straight from the okra chef: Clean it, slice it in half longways, toss it in a bowl with some olive oil, sprinkle with salt and pepper, bake on a roasting sheet at 375 until it browns. Or you can cut it in thick slices and roast with potatoes, carrots, etc. That’s the way I do it and there’s no slime. I can’t stomach the slime either, but I think that’s what thickens Cajun gumbo and it always has some okra. I’ve always liked gumbo and probably didn’t know okra was in it. if all the zucchini grown in one season were laid end-to-end? that would be a good use for them! If only bacon reproduced at such a prolific rate. Well, there are farmers and ranchers here in Texas who will tell you it does, at least if you want to make your bacon from wild hogs. Those things reproduce at an explosive rate, and are a destructive menace to agriculture and wildlife alike! If they became a menace around here, I’d certainly take up hunting in a hurry. 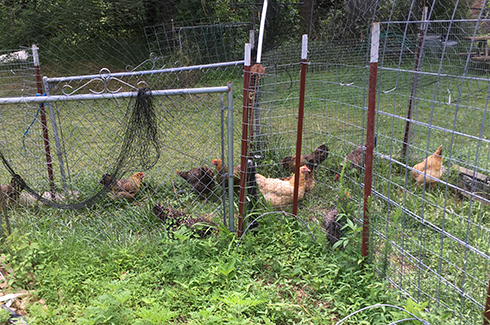 ” Another benefit is being legally allowed to shoot off fireworks on our own property.” Doesn’t that interfere with the chickens laying and scare the other animals? It’s a big property. Chickens are out back, the fireworks out front. Speaking of chickens, yours look beautiful! 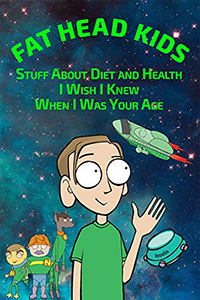 I know you probably eat them when they get too old to produce eggs. How are they? Not being young, but being way above average health-wise, can you cook them any old way, or is stewing the best? From what I’m told, if you don’t eat chickens after a few months, the meat is tough. I suppose they’d make good stock, though. Any crock pot/slow cooker recipe is usually good. Pressure cooking is also a good method. I’ve cooked three at a time this way in less than an hour, then canned the meat when we’ve processed a big group at the farm. The Wife makes a great Buffalo Chicken dip (that we serve with pork rinds) using this meat — I think Tom may have got in on that in Dauphin Island(?) –and also in sundry casserole and chicken salad recipes. And while coq au vin, technically a recipe for roosters (hence the name), can also use a hen, the French practically consider it a crime against nature to NOT use an old bird, as you miss out on the stronger flavor the recipe was created to enhance. Appreciate the advice. If I had the Buffalo chicken dip on Dauphin Island, I don’t remember it. Sounds like something I wouldn’t forget. Speaking of fireworks scaring animals, my granddaughter’s already psychotic Siamese cat now needs to be admitted somewhere! She has barely come out of hiding to eat since the fireworks. I always love seeing the farm report! “My Dad once warned me that if I left my car unlocked in the summer, people would leave zucchini in the back seat.” It’s true! I came home from the grocery the other day to find a bag of zucchini hanging on my doorknob!! I still don’t know which “friend” did that. I did find a new use for them this year. I sliced them in half length wise, scooped out the insides, sauteed the chopped insides with crumbled sausage, peppers, onions and tomatoes, re-stuffed the scooped out zuch halves. Covered with Mozzarella cheese and baked till the outside zuch is tender. Was actually quite delicious and you could barely tell you were eating zucchini ONE MORE TIME! From a born Southerner, if your okra is slimy: A. You have cooked it too long. or B. You are making Louisiana gumbo and you need the okra to thicken it. I cut my okra when it is barely four inches long, throw it in a steamer pot and steam just till fork tender, salt and pepper, butter and it’s delicious with NO slime. I haven’t tried it roasted, but I definitely will next cutting! BTW, in this part of the world, Wal Mart is selling packages of dried salted okra on racks like chips, etc. I’m thinking of throwing some of mine in the dehydrator with sea salt on them and seeing what happens. 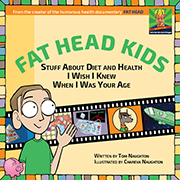 Your children are so fortunate to be growing up knowing where their food comes from! The last time I went to get some delicious “yard eggs” (as we call them here,) I was given a lot extra. I offered some to my next door neighbor, and she declined, saying she wouldn’t eat those things. She only ate the “clean” store-bought eggs! Uhh?? And just where does she think those eggs came from? The egg fairy?? It was so nice to see your little helper actually working with the eggs getting them ready for the stand! She doesn’t know how lucky she is!! I hope Chareva’s parents are doing better. Chareva’s parents appear to have finally sold their house near Chicago. If the sale goes through, they’ll be moving down here, where Chareva can keep an eye on them. As an occupational therapist i work with a lot of older patients who do not have family nearby and end up in a facility because they have no one to check on them. Good deal all around when old parents are near adult children, they get the oversight they need, and the adult children worry less. Yup, we’re looking forward to having them nearby. Tom, have you had any experience with chickens eating their own eggs? If so, any solutions? I believe Chareva has seen that happen once or twice, but it’s not a constant problem. I follow this woman on FB. I don’t keep chickens, but she seems to be a fount of good information on them. 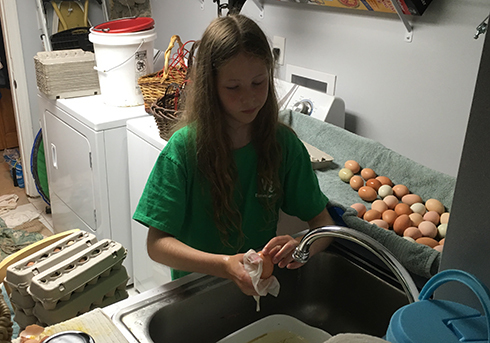 Check for eggs regularly, make sure they’ve got enough room in the coop and minimize other stressors. Make sure they’re getting enough calcium — you can supplement with store bought oyster shell, but can also grind up your (cleaned) egg shells. You set them out “free choice” — meaning in a separate bowl or pile instead of mixed in with their normal feed. You can also check the local farm supply store (or go online to a hatchery/livestock supplier) and buy one or two “fake” eggs. They’re marble or something very hard and tend to convince the birds not to peck on round objects! Okra is the immature form of the pods from “Invasion of the Body Snatchers”. We owe it to the future of the human race to make as much gumbo as possible, to cull the pods before they take their final form. Well, I’ve met a few people who were roughly as intelligent as okra, so I believe you. People tend to underestimate the intelligence of non human life forms. Some of the other apes drop unnecessary steps in experiments more than human children. This usually works, but when doing stuff like running a nuclear plant can produce havoc. Pea plants are perhaps better at risk assessment than people. Perhaps we should put pea plants in charge of the Federal Reserve. Soo.. Would a pea plant hit on 16 during blackjack or no? My first year growing zukes, and I have already dehydrated a few. There are lots more coming of course…but my dehydrater is ready! Ive always heard that they go crazy once they get started, so I was prepared. To be honest, I have dehydrated store-bought zukes before, and love them, which gave me the idea to grow my own. Rehydrate them in soups or whatever or eat them like chips…jars of dehydrated zukes are awesome to have in the winter! Good idea, especially given how prolific they are. When I was young and lived in Russia we did a lot of canning because fresh produce was not available at all in stores in a winter time. We canned a zucchini spread(sauteed carrots+onions, than cooked with Z., added tomatoes, garlic, herbs, than pureed) and sliced sauteed zucs put in a jar and sterilized. Perhaps setting up a game camera may help identify the offending critter killer you have lurking around the property. That way you can change tactics if necessary. I just set mine up today. I hope it works. I seem to remember the timer didn’t work last time I tried it. Hi Tom, I just heard about a new way to deter predators that you might like called niteguard which emits a red flashing light starting at dusk after charging by solar all day. My hubby and I currently use premier one electric fencing for our chickens but I’m trying this new device out on my guineas. The niteguard is easier and cheaper than the electric fencing. That sounds worth checking out. Thanks for the tip. We enjoyed putting on the show, thanks. Sounds like you have a weasel problem. My family did up in the Tri-Cities area and it did to the birds just what you said. The traps work better if you bury them. If course, we did sit out one night and pick off a few of the little bastards. (We are the type of rednecks that do in fact have night vision scopes on our AR-15s) which was gratifying. Theyre tiny little suckers, so you have to make sure that fense is sealed up tight. Could be. We’ve had raccoon problems in the past, but the area where a critter dug under the fence didn’t look big enough for a raccoon. If the critter keeps at it, I may just invest in that night-vision scope. Ugh, squash bugs are the WORST. I think I’ll be taking a break from planting squash after this year. 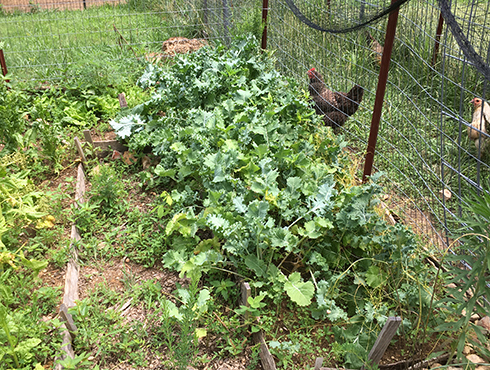 I tried covering my raised beds with bug netting, sprinkling diatomaceous earth, hand-plucking the endless egg bunches off the leaves … to no avail. Every last plant was still dead by the beginning of July! I thought parasites were supposed to leave their host alive, but I guess squash bugs didn’t get the memo. No, they seem to devour everything. “…These plants need a more Acidic soil condition so as to help regulate the Nitrogen, and keep it in the Cationic state so the Plant does not get to much of the Isotope which is Nitrate Nitrogen, for this form of Nitrogen may cause the plant to it’s self become too Acidic from a lack of Alkaline Minerals in the Plant! This all probably sounds Greek to you , so I will try to make it simple for you to deal with! You have a few options which you may try! 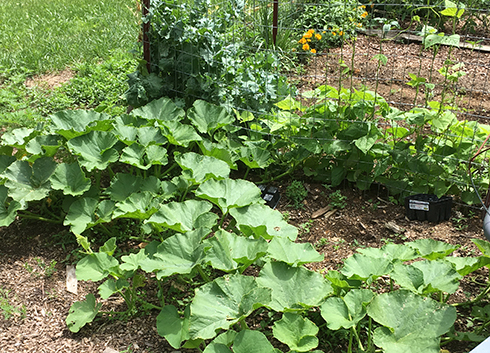 1st you may cut the growing ends of your squash plants off, this may throw the plant into the Cationic stage which may help correct your problem! 2nd you may try spraying a mix on your plants: Mix one tablespoonful of Epsom Salt in one Gallon of water and add two Tablespoonful of Blackstrap Molasses to this and spray on the plants of an evening ! You may need to spray more than one evening and do not use a sprayer which has had any Herbicides used in it! You may want to spray some plants heavier than others to see how much it may take to do the job! If the plants start growing faster, you may need to use a little more Epsom Salt in the mix, but if you use too much you may Burn the leaves! This year, we need a “leave okra on your neighbor’s porch” day.